"If you're ready to graduate from the boy-meets-girl league of screenwriting, meet John Truby . . . [his lessons inspire] epiphanies that make you see the contours of your psyche as sharply as your script." John Truby is one of the most respected and sought-after story consultants in the film industry, and his students have gone on to pen some of Hollywood's most successful films, including Sleepless in Seattle, Scream, and Shrek. The Anatomy of Story is his long-awaited first book, and it shares all his secrets for writing a compelling script. 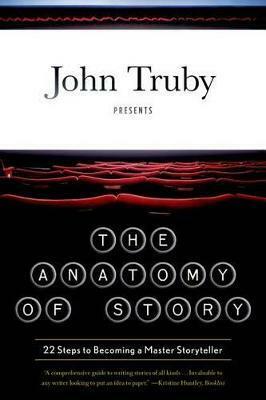 Based on the lessons in his award-winning class, Great Screenwriting, The Anatomy of Story draws on a broad range of philosophy and mythology, offering fresh techniques and insightful anecdotes alongside Truby's own unique approach to building an effective, multifaceted narrative. John Truby is Hollywood's premier story consultant and founder of Truby's Writers Studio. He has worked as a story consultant and script doctor for Disney Studios, Sony Pictures, FOX, and HBO, among others, and has taught screenwriting to students worldwide.